After painting the bottom of the boat, changing zincs and taking the shrink wrap off (hopefully we will get launched this week) I had time to sit and do a couple of sketches in my little book. The picture above was an experiment without using my pens, just light pencil for layout and watercolor. I sometimes feel like my drawings must look like a coloring book, and I gotta admit this is a much harder way for me to create a scene, and I don't think is as successful as I had wanted or imagined. However we must be intrepid in our quest, so I will definitely continue to try this technique from time to time. 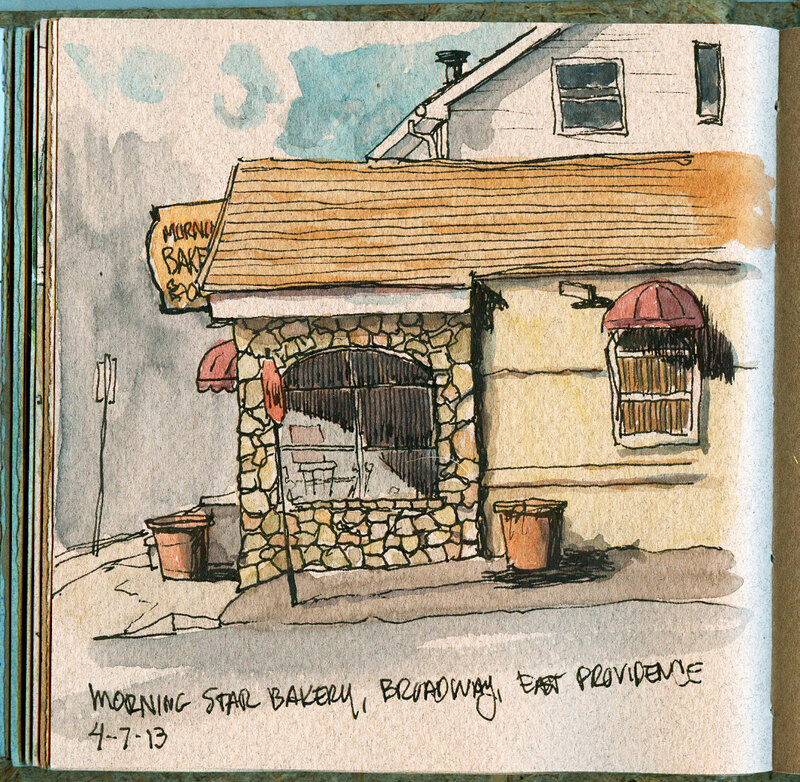 This is a great little bakery about a half mile from our house. I say it is great for three reasons, the prices are reasonable, the pastries are very good and, as I said - it is about a half mile from the house. I was driving back from doing the skyline sketch and as I turned onto Bliss, I just had to stop and sketch it. . .(No really it is on the corner of Bliss St and Broadway) And by the way this sketch and St Francis Xavier Church were drawn with my new Lamy sketch pen.